The Invisible Man is a science-fiction novella by author H.G. Wells. Published in 1897, this story is about a scientist who is obsessed with learning and researching the study of optics. He invents a way to change the way light and radiation pass through mediums. In doing so, he carries out tests and procedures and ultimately – you guessed it – makes himself invisible. In the end, he is unable to reverse the technique. The same idea holds true for countless non-profits today. Though they haven’t exactly tried to make themselves invisible, they haven’t done much to make themselves visible. There are two main problems. The first is that many non-profits assume everybody knows about them, and this is simply foolish. Say that a woman starts a non-profit to collect toys for underprivileged children. She works out of her home, and her only way of promotion is word-of-mouth. She may get a few toys donated to her by friends or family; but overall, the masses will not know about her organization. The second problem is that a lot of non-profits think self-promotion is harmful to their image. This is also false. Take the Red Cross, Feed The Children, and Goodwill. All of these organizations self-promote, and in turn, they receive hundreds of thousands of dollars in donations every year. The bottom line is that people cannot become involved in a cause if they don’t know about it. You need to position yourselves in such a way, that people literally stumble upon your group. You must (subtly) get in their face and make a lasting impression. How do you make a lasting impression? Did you know Google offers a grant to eligible 501(c)(3) organizations? Did you know that grant is valued at up to $120,000 a year? Google is the Times Square of advertising space. It is truly prime real estate that garners millions of views every single day. 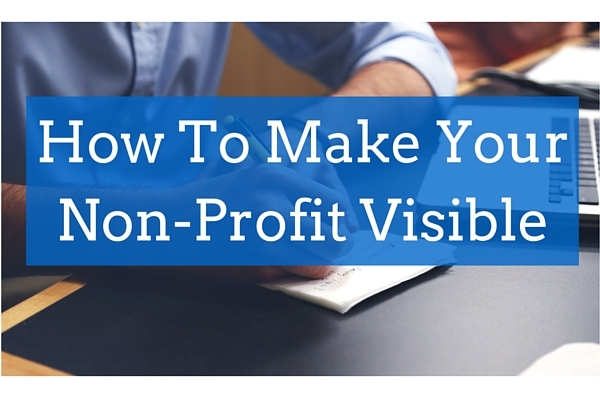 How would you like to see your non-profit’s mission stamped across the very first page of Google search results? 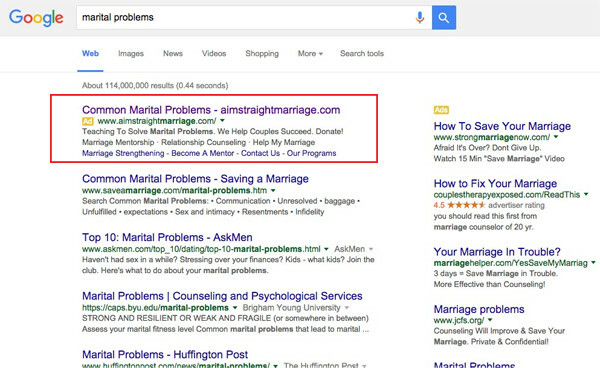 Take the following screenshot for example: A user typed “marital problems” into the Google search bar. The very first result shown is an ad for Aim Straight Marriage, a non-profit group. Since users typically click on the first result listed, Aim Straight Marriage is bound to get more clicks than any of the other results on the page. Placement matters. Think about it: how deeply do you search Google? Do you go beyond the first or even the second page? If people do not find what they are looking for, they will either stop looking or change their search query. Google often pulls up 100s or 1000s of search result pages. How useful is your ad on the 3rd, 5th, 11th, or 38th, page of Google? The first page of Google search results is where you need to be. The Google Ad Grant is a fantastic way for many non-profits to get the visibly they want and need to flourish. You’re probably thinking, “how can I get that grant?!”. Read on! How can I get the grant? When the Better Communication Forum was just starting out, we needed a marketing expert to show us the ropes. idGrants specializes in obtaining the Google Grant for non-profit organizations. They do the legwork – applying for the grant, writing the application, writing the ads, and creating designated landing pages for 501(c)(3)s. They know how to get first page placement on Google. Their AdWords Specialists know the rules, regulations, and Google’s ever-changing algorithms. idGrants cost is already quite low, however, If a non-profit cannot afford to hire idGrants to help them, idGrants will help the non-profit find a sponsor to pay for their agency’s service. The Google Ad Grant is obtainable for non-profits to pursue on their own. However; the process is tedious, time consuming, and confusing. Additionally, if the non-profit doesn’t employ Google Certified AdWords Specialists, it is very difficult to be displayed on the first page of the Google search results. Too, Google has strict rules when it comes to advertising on their site; if rules are broken, the grant can be taken away from the non-profit. The Google Ad Grant is such an amazing opportunity and tool for non-profits. To learn more about how idGrants could help your non-profit, visit: www.idGrants.com. idGrants is a financial supporter of the Better Communication Forum. Copyright © 2019 The Better Communication Forum. Powered by WordPress. Theme: Spacious by ThemeGrill.